Simplicity, symmetry, and sublime luxury permeate throughout this exquisite residence in the Sai Kung District of Hong Kong. Known locally as the “Garden of Hong Kong”. This is an area were private indulgence leads to remodeling of enticing properties such as this. Creating bespoke residences at the upper level of the property spectrum in the most affluent areas of one of the most expensive cities in the world is almost a prerequisite. This is exactly what was accomplished with this enticing luxury property in Hong Kong. If there’s one thing to know about housing in Hong Kong, it’s that space is regarded as a premium from the working class to the upper crust. Housing a population of almost 7.6 million people in a condensed 426 sq. mile space requires a special level of luxury to stand above all others. Attentive space management is a prerequisite to encapsulate an atmosphere of luxury in a modern home in the context of the exuberant wealth of the elite residents of the city. This home is the perfect manifestation of luxury at the highest level. The showpiece of this 4,897 sq. 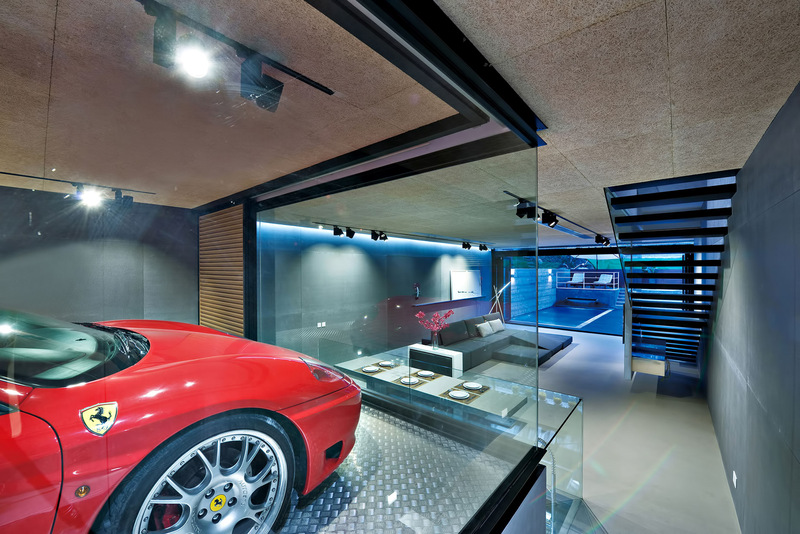 ft. residence is an interior glass car garage that displays the owner’s supercar Ferrari collection as a centerpiece of the homes decor. The entire residence is a display of reconstructed space that adds a sense of ambiance throughout the liberal glass and brushed steel common areas. The cleverly sunken-in kitchen and elevating dining table only add to this smart, elegant design adding a distinct fluidity to the unique interior design.